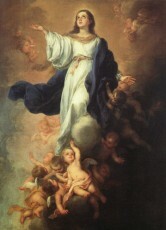 The Assumption of the Blessed Virgin Mary into Heaven, is the celebration of the “bodily taking up” of the Virgin Mary into Heaven at the end of her earthly life. It is dogma, the teaching of the Roman Catholic Church that the Virgin Mary, “having completed the course of her earthly life, was assumed body and soul into heavenly glory”. Pope Pius XII, on November 1, 1950, stated in his Apostolic Constitution, “Munificentissimus Deus” this doctrine as “dogmatically and infallible” truth. Catholic dogma leaves open the question of Mary’s death before rising to Heaven. The Assumption is a major feast day, celebrated on August 15, and is marked in the Roman Catholic Church as a Holy Day of Obligation. It was on August 15th, 2004 when Pope John Paul II during his homily at Lourdes quoted John 14:3 as one of the scriptural bases for understanding the dogma of the Assumption of Mary. In this verse, Jesus tells his disciples at the Last Supper, “If I go and prepare a place for you, I will come again, and will receive you to myself; that where I am, you may be there also”. According to Catholic theology, Mary is the pledge of the fulfillment of Christ’s promise. In many countries, the feast of the Assumption is not only a Church Holy Day, but also a feast that is celebrated as a public holiday. Some of those countries are, Austria, Belgium, Chile, Colombia, Ecuador, France, Germany, Greece, Lebanon, Lithuania, Italy, Malta, Mauritius, Poland, Portugal, Senegal, and Spain. In the dogmatic statement, the phrase, “having completed the course of her earthly life”, leaves open the question of whether the Virgin Mary died before her assumption or whether she was assumed before death; both possibilities are allowed. Mary’s assumption is said to have been a divine gift to her as the “Mother of God”. The point of her bodily death has not been infallibly defined, and many believe that she did not die at all, but was assumed directly into Heaven. On November 1, 1950, Pope Pius XII solemnly declared: “By the authority of our Lord Jesus Christ, of the Blessed Apostles Peter and Paul, and by our own authority, we pronounce, declare, and define it to be a divinely revealed dogma; that the Immaculate Mother of God, the ever Virgin Mary, having completed the course of her earthly life, was assumed body and soul into heavenly glory”.